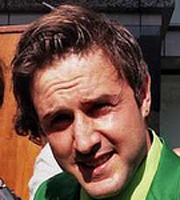 David Arquette has appeared in several films and TV shows, most notable of which is the Wes Craven "Scream" Trilogy, and playing the role Jason Ventress on succesful TV show "In Case of Emergency". Other notable appearances include roles in such films as: "Eight-Legged Freaks" and "Ready To Rubmle". Off-screen, the actor is married to "Friends" starlet Courtney-Cox Arquette and was, interestingly enough, a professional wrestler who went on to win the WCW World Heavyweight Championship � the top title of World Championship Wrestling.